With so much to do before Thanksgiving, I decided to set my table a day ahead. As much as I like to prepare and plan ahead of time for my table settings, I always make last minute decisions based on color, mood, linens, glassware, china and of course, my whim. I always call these last minute changes, 'executive decisions'. It's one thing to put things down on paper or have an idea of what a table setting should look like, but it's a different thing altogether when you have everything before you. I knew that I wanted to use my beautiful gilded Wedgwood drabware for most of the china, but since I enjoy mixing patterns and colors, I reached for a few of my antique, British ironstone plates. These pieces are over 100 years old and have a lot of crazing on them. With age and use, the ironstone has taken on a creamy quality which is perfect for the drabware. The linens are a mix of brown & pumpkin European jacquard with golden accents and the flatware is old French silver and American bakelite. 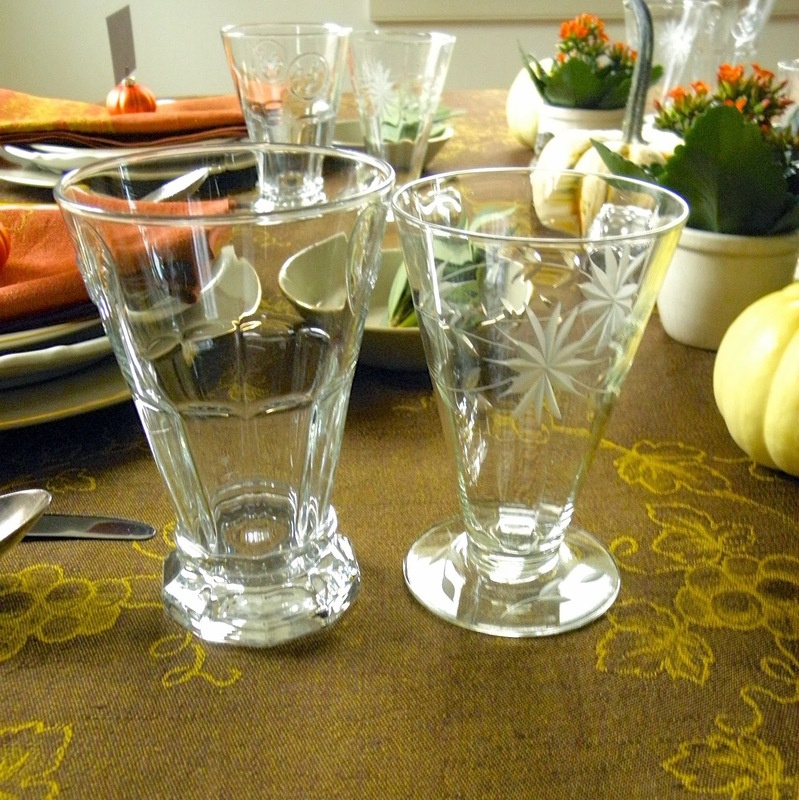 The glassware is a combination of contemporary American and antique European etched glass. Last but not least is the simple centerpiece. Since I'm not one who gives in to pomp and circumstance, a restrained, yet elegant centerpiece consists of pumpkins, orange-colored kalanchoes, old custard cups and sprigs of fresh bay leaves. My table is easy on the eyes and nothing distracts from conversation and the Thanksgiving feast before us. I hope that my table gives you ideas for your decorations this holiday season. Enjoy creating a beautiful table! color of the orange flowers. almost matches the old ironstone I'm using. were placed in the custard cups. over to the table to begin arranging. aren't matching pieces, the colors complement each other. had to pair them with the Wedgwood. You can see how elegant that rim is with its vine. an elegant table because they look beautiful. glasses will be used for red wine. 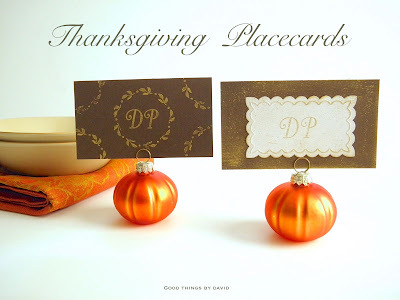 I love my Thanksgiving Place Cards because they're simple to make. won't go to waste after our dinner. The pumpkins are leftover from Halloween. the minis turned a wonderful pale yellow. top of the salad plates instead. watermarks or other unsightly blemishes on your glassware. a very Happy & Joyous Thanksgiving! Everyone needs a good, basic cranberry relish for the holiday table. I make mine every single year to enjoy with our turkey and other sides, but I truly like to have it slathered onto a buttered biscuit, roll or piece of cornbread. It's that mix of sweet and salty that truly makes a relish like this mouthwatering. My version, however, doesn't contain a lot of sugar like most recipes. I think it's nice to have a bit of the tart flavor from the cranberries with every bite. The packages of fresh cranberries that one gets at the grocery store have cooking tips and recipes on the bags, which one can easily follow, but if you add a bit of something here and there, the relish takes on more depth and flavor. From year to year I experiment with different dried fruits for added texture, but the two ingredients which never change are freshly grated orange zest and the cinnamon stick. If I travel to California for the holidays, I'm in charge of the relish (actually, they put me in charge of everything!). People reach for this relish throughout our dinner and by the time we're done I can assure you that none is left. It's that good! As I write this entry, I've just finished this year's version and it's sitting on a cooling rack above the marble dough counter. Since this keeps for quite a while, I love making it at least one to two days ahead of Thanksgiving. In a large saucepan, add all of the ingredients and set over medium heat. Stir with a wooden spoon until the cranberries begin to pop. After several minutes the mixture should thicken considerably and most of the cranberries should be split and broken down. It's good to leave some whole for texture so don't overcook the relish. Turn off the heat and remove it to a clean bowl to cool down to room temperature. When it has cooled wrap it tightly and keep it in the refrigerator until your dinner is ready. Cranberry Relish will keep for up to one week in the refrigerator. Bring it to your table in a compote or pretty bowl and set a spoon next to it so that people can help themselves. Place cards bring a certain elegance to any table no matter how simple or elaborate the design. It's nice to have a place at the table for each of your guests, and the idea of putting a card which designates where one ought to sit makes the table even more special. This year I decided to make simple place cards for my small table in autumnal shades of browns and golds, because I wanted to complement the colors of my china and linens for our dinner. Place cards can be bought at stationery stores with embellishments already on them and they can be of the variety that fold for easy placing. These tend to cost a bit of money, but they're nice and they're very convenient if you don't want to create a fuss. For my table, though, I bought colored business cards and used stamps to make an easy monogram for each person. I like the results and I think you will too. There is still plenty of time to create these before Thanksgiving and I encourage you to have someone who's crafty to create them for the table. However, they're simple enough for you, the host, to make when you have a spare moment. These bracket stickers found at craft stores are so elegant. They make wonderful tags for gifts and packaged baked goods, but they can easily be applied to a business card for this kind of project. Choose the letters of your guests and either spell out their name or create a monogram like I did. It's so easy to use clear stamp mounts with rubber stamps because it takes the guess work out of keeping things straight. I found these mini pumpkin ornaments made of silver glass and thought they would be just the thing to hold place cards. I love the color of the minis. For my project I found a wreath stamp to frame each monogram. The wreath was placed on the mount first and then the letters were centered. With a bit of pigment from the ink pad I tested out the design on a piece of paper to see how it would look. To further embellish each place card, I continued part of the wreath design on each corner. The corners received 1/4 of the wreath stamp to make a frame. For the bracket sticker version, I centered the label onto the business card first. Using the monogram stamps without the wreath, I centered the letters and stamped the monogram. Using the ink pad, I daubed pigment haphazardly around the place card to give it an old rustic look. I love this effect! Framed wreath place card on the left and antiqued bracket on the right. For my table this year I'm using jacquard linens, gilded Wedgwood drabware, colored glass ornaments and easy place cards. Stay tuned for my Thanksgiving table! A tasty addition to the lineup of Fall cookies which call for spice, Pumpkin Oatmeal Raisin Cookies are great for those who don’t want pie at the holiday table. One comes across pumpkin everything this time of year and I for one, love it. Whether it's pumpkin bread, pumpkin pies, pumpkin hand pies or custards, I'll always try a dessert made with this autumnal squash. I feel like Fall isn't the same without a bit of pumpkin and spice. If you happen to like pumpkin sweets then you're in luck, because my version of oatmeal cookies will have you reaching for them as soon as the first sheet comes out of the oven. 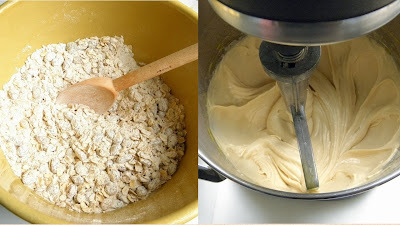 The wholesome ingredients of whole wheat flour, oats, raisins, butter and pumpkin puree come together quickly and, if truth be told, one can easily make a batch without a stand mixer. A large bowl, a heavy wooden spoon and lots of strength will get through this recipe in no time. Go through your pantry and make sure you have everything in stock before you begin my recipe. It's the kind of treat you'll want to warm your house up with when the weather is cold out and you find yourself without a cookie. Start your tea and have it waiting the moment your last tray is out of the oven. Sit back and enjoy a cuppa with one or two cookies. They're great for unexpected company, by the way, or as I said, on a cold, blustery day. Any leftover treats can be stored in the cookie jar, but they can also be packaged up for special delivery if someone needs a bit of sweetness. Since the cookies are very moist and almost cake-like, they will keep for several days if stored in an airtight container. Let's bake because I know you're tempted to try some. Equipment: 2” ice cream scoop, baking sheets lined with parchment or silpat. In a large bowl, whisk to combine the all-purpose flour, whole wheat flour, ground cinnamon, ground ginger, baking soda, salt, old-fashioned oats and raisins. Set aside. In the bowl of a stand mixer fitted with the paddle attachment, cream the melted butter, light brown sugar and vanilla extract on medium speed until thick and creamy, about 2-3 minutes. Add the eggs one at a time and beat well. Stop the mixer and scrape down the bowl at least once. On low speed, add the pumpkin puree and beat until combined. On low speed, add the dry ingredients and beat until the cookie dough is formed. Using a 2” ice cream scoop, portion out 6 rounds onto each prepared cookie sheet. 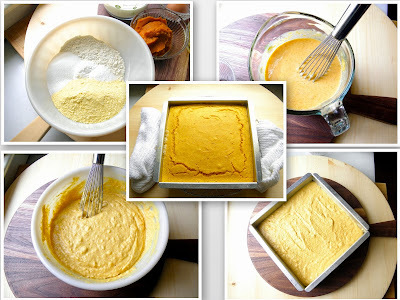 Bake each sheet for approximately 11-14 minutes. Remove from oven and let cool on rack for 1 minute before moving onto cooling racks. Let cool completely. Do you see all of the goodness? Enjoy your tea with a cookie or two like I do. It all started at the request of some of my friends. Three years ago I sat down and decided to write a blog as a way to catalog what I was creating & doing at home. All I knew at the time was that I wanted to explore recipes, show step by step instructions for friends and give them the things which have made my life easier and more enjoyable. I wanted to share those good things like I had never done before. This was my first post on November 23, 2010: Friends & family have been prompting me to create a blog which showcases pictures, recipes & helpful hints that make my life easier and more enjoyable. I'm not sure where I will take this, but here's to the beginning of something wonderful. I hope to fill this blog with Good Things for you & your loved ones. There are two people I have to thank for when I wrote that entry three years ago. The first is my long time friend of twenty years, Ashley Hoffman, who happens to be a superb graphic design artist. She was the one who gave me the 'push' to begin blogging. If it hadn't been for her, I would not be doing this. You'll read more about Ashley very soon. The second individual, is my friend & blogging colleague, Andrew Ritchie. If it hadn't been for his magnificent blog I would not have known where to even begin! So, to them I say, Thank You! Good Things by David wouldn't be what it is today if it weren't for their encouragement, kind words and friendship. As I reflect on these three years of writing, photographing, styling and editing for Good Things by David, I’m amazed at how my audience has grown and how supportive you have been throughout the process. When I think about how long some of my blogging colleagues have been writing and maintaining a blog, I feel like a newbie in this arena. I'm really proud of what I've accomplished here in such a short period of time and I hope to be doing this for many years to come. Thank You readers for your continued support. Blog Header Images from the past.